Karen Cahn, former Google and YouTube executive, thought her timing was going to be perfect. She launched iFundWomen, a crowdfunding platform for women-led businesses, in November with the idea that a female would soon be president. Obviously, things didn’t go as planned, but Cahn says it didn’t slow the site’s momentum. In fact, during the site’s beta period in November and December, the 25 companies in the first cohort collectively raised $250,000. “I think that absolutely fueled our growth even faster because people really banded together, men and women, to help women’s small businesses get off the ground,” Cahn points out. Helping with the early success was Cahn’s idea of the importance of hyperlocal crowdfunding to keep people invested and pump funds into local economies. A Google search for the top 10 areas for female-run start-ups and small businesses led her to Nashville. Mayor Megan Barry and Audra Ladd, manager of small business and creative economy in Nashville, watched Cahn on CNBC’s “Squawk Box” just weeks after the launch and reached out to her. More than 200 Nashville-area women applied to be included in the local iFundWomen launch. Along with attracting hyperlocal, women-led businesses, Cahn wanted to build a platform that was flexible and grew along with the companies that were using it. She allowed companies to change goals and rewards mid-campaign, and the platform has a pay-it-forward model, offering one-on-one crowdfunding coaching and video-production services to entrepreneurs. Another aspect was getting people to give to more than one campaign per site visit, a very rare behavior for a crowdfunding user other than tech fans looking to always be tapped into the latest stuff. Cahn also knew from being in the business community just how needed something geared to early-stage women entrepreneurs was. Amy Cotta was in her attic one day and came across her Marine son’s old JROTC uniforms. Knowing she couldn’t fit into them she wondered if there was another way to wear them to feel close to him. 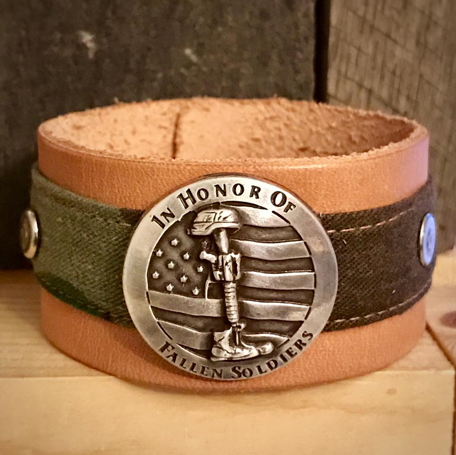 She pulled out a patch her father had given her from his time in the Army, and she combined the two items to make a bracelet. Slipping it on her wrist, it became her own “a-ha” moment. Cotta had already been running and competing in endurance events wearing combat boots as a way to honor the military through Medals of Honor. Now a 501c3 nonprofit that pairs runners with families of fallen military, then it was just a pet project bleeding money. By selling these bracelets made from donated uniforms and patches, she could fund the charity. She took classes at the Nashville Entrepreneur Center and ValorBands was born. It was also at the EC that she heard about the iFundWomen Nashville launch and was one of the first programs accepted. Her goal with iFundWomen is to raise $15,000 to expand Medals of Honor to help veterans transitioning out of service or transitioning out of homelessness into transitional housing. Proceeds from this crowdfunding campaign would go toward job training or school for two veterans. Amy Cotta started Valorbands, a company producing bracelets from donated uniforms and patches. She hopes to raise $15,000 through iFundWomen. The nonprofit would also provide the vets with a good sewing machine to take home so they can do contract work for ValorBands while they are in job training. At press time she had raised just under $2,000. This is Cotta’s first experience with crowdfunding, though she has done plenty of fundraising. She says selling a product like ValorBands to support Medals of Honor is much easier to do than to ask for donated funding without some kind of tangible reward. Crowdfunding is just an extension of that as she offers merchandise rewards for sponsorships. Still, asking for money is incredibly hard for Cotta. Being surrounded by other women business owners brave enough to ask for money too has been empowering. In the first day of the launch 25 Nashville businesses raised close to $25,000, Cahn says. Another one of them was Frisson Soft Serve Gelato Truck, owned by Caila Singleton and Elise Schempp. They hope to raise $12,500 to buy a second machine that will be devoted to just vegan offerings. This is Singleton’s first experience crowdfunding though Schempp has had a positive experience before raising money for a family member’s personal cause. They had only raised $800 at press time but have found the support of other women to be incredibly positive. Cotta says it’s almost the support more than the money that has helped her confidence in what she is doing with ValorBands and Medals of Honor. With the success of Nashville’s launch Cahn is excited to add more cities to the site. “I think that women are now really realizing that we really need to stick together,” Cahn says.